At USAID LEARN we’re always looking for ways to improve effectiveness and efficiency of development outcomes. 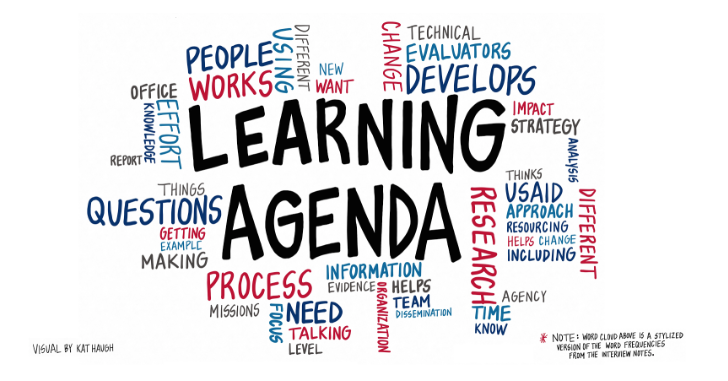 Our work with Collaborating, Learning and Adapting (CLA) has led to a new organizational tool: the “learning agenda.” They can be a powerful way for teams and organizations to respond to evidence gaps, generate new knowledge and apply that information to improve their work. Learning agendas create feedback loops. Learning agendas are pretty simple—they have three parts: a set of questions around what you need to know, a series of activities to respond to these questions, and corresponding products that enable you to disseminate findings to others interested in them. Learning agendas can have many purposes, but at the heart are focused on being action-oriented and on finding information to inform effective decision making. While the agenda is often a document, our research suggests that the process of formulating and implementing learning agendas also serves to support larger cultural change within organizations supporting continuous improvement. Use all of the knowledge. Our research showed that the most effective learning agendas went beyond traditional research and evaluations to combine a range of evidence – including experiential learning. Convening communities of practice supports learning through networks, such as “Theme Teams” or “Experience Summits.” Sharing experiences among peers can provide clues and information to build contextual knowledge of how, why and when our interventions work – or don’t – as planned. Collaborate, engage and participate. Second, interviewees emphasized the importance of engaging diverse stakeholders throughout the formulation and implementation of learning agendas. An iterative, consultative process is important, but so is knowing when and how to avoid “consensus fatigue.” Choosing the right method and level of involvement is critical to ensuring useful and mutually beneficial collaboration. This ran a spectrum from low engagement – informing stakeholders with objective information on the learning agenda – to high involvement – formally integrating stakeholder feedback into decision-making processes and having active ownership over the learning agenda formulation and implementation. For instance, the Local Solutions learning agenda at USAID creatively crowdsourced the synthesis and analysis of USAID evaluations related to local partnerships, capacity, ownership and sustainability in order to answer critical questions about what worked best. Apply and use: twin mantras of learning agendas. Finally, focusing on knowledge use to inform decisions increased the relevance and application of new learning. This often inspired the development of innovative products and platforms such as webinars and infographics for specific audiences. Linking learning questions and themes to relevant policy objectives increased the relevance and saliency of the agenda. Depending on the audience emails, webinars,infographics and videos proved to be effective engagement platforms. Our research suggests a variety of communication methods, often targeted, actively increase the application of learning. Learning agendas can synthesize and focus learning and provide structure and space to integrate feedback loops into development programming. Learning agendas can inform your critical decisions: whether they are about the direction of programming based on a synthesis of evidence to the creation of a program to address newly identified needs, like USAID’s localworks that emanated out of a learning agenda, or inform government policy, as the Feed the Future learning agenda did in the U.S. Government’s Global Food Security Strategy. Matthew Baker is a Monitoring, Evaluation, Research and Learning Specialist with the USAID LEARN team. He has a development background focusing on democracy and governance, has lived in Burma/Myanmar and Sudan and degrees from University of Oxford and Columbia University. LabStorm: Is feedback an important data point? 3TT: From data-to-action: how can we close the feedback loop for Ugandan police services? Americans gave $358 billion to charity in 2014. Did “beneficiaries” have any say in the matter? Can the act of giving and receiving feedback create citizens instead of beneficiaries? When will the World Bank prioritize learning over lending?